The Single Cab Bakkie is the toughest, most cost-effective bakkie on the market with less fuel consumption, increased-towing capacity and an increased load space. Perfect for moving to a new house, apartment or school. 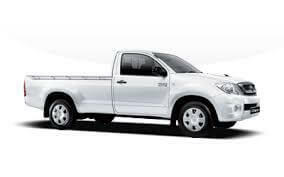 Get yours from Pace Car Rental in Johannesburg at the lowest price! Great service and even better rates. Drop us an email at info@pacecarrental.co.za or call our friendly sales agents on 011 262 5500.